“It’s just outrageous how Hillary Clinton sold her office for money,” said Kallstrom who has long been a critic of the Clintons and President Obama. In another interview Sunday, Kallstrom said that the handling of the probe into Clinton’s emails by FBI Director James Comey was sowing dischord among rank and file FBI agents. Did the FBI chief lie to Congress about the Hillary email probe? Yet the FBI says it “was unable to obtain the original Apple server for a forensic review.” Instead of seizing it, the agency has taken Clinton’s aides’ and lawyers’ word that the server’s bereft of relevant emails. 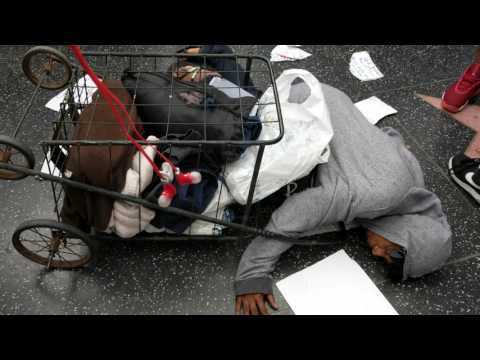 SHOCK: Homeless black woman attacked by Hillary mob for defending Trump's Hollywood star! This attack on a defenseless homeless black woman who went into a fetal position and lay still on the sidewalk to protect herself from the hateful mob is disgusting and made me sick to my stomach. Did a key Clinton aide commit perjury? It appears there may be more to why Hillary Clinton’s campaign vice-chair has been absent from the trail of late. 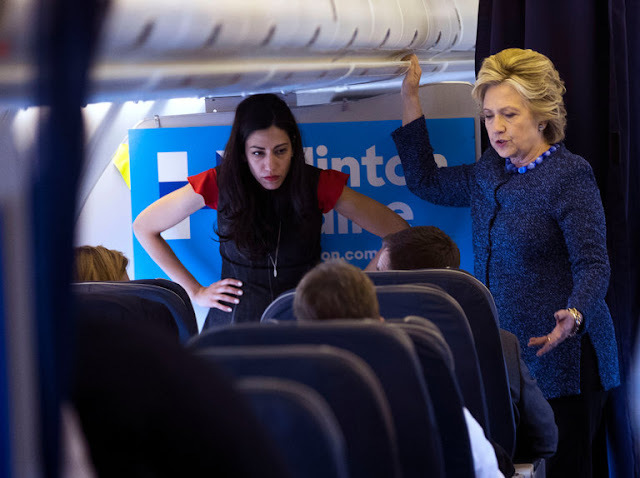 Following the FBI’s bombshell discovery of thousands of new documents deemed pertinent to their criminal investigation of Clinton’s email server, two new reports are raising serious questions about whether her longtime aide, Huma Abedin, perjured herself. Abedin's testimony in the civil suit was complicated by a routine State Department document she signed under penalty of perjury in February 2013. She promised she would "turn over all classified or administratively controlled documents and materials" before she left her government job, and promised that she was not retaining copies, "including any diaries, memorandums of conversation or other documents of a personal nature." The document required her to give back all "unclassified documents and papers relating to the official business of the government acquired by me while in the employ of the department." This development surrounding someone who would certainly inhabit a West Wing office were Clinton to win is a troubling reminder of the above-the-law mentality Clinton and her inner circle operate with when they are in positions of power. With the race tightening, how long will Hillary Clinton continue to stand behind her? 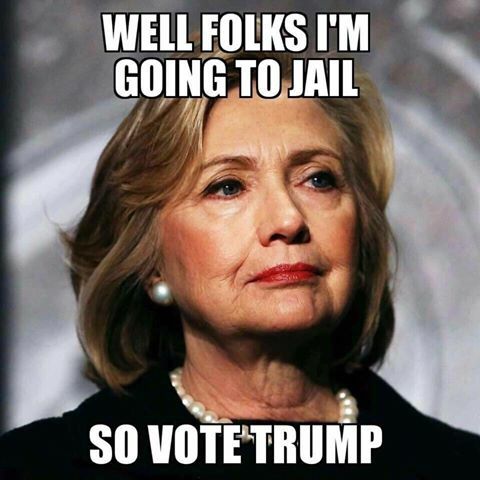 WASHINGTON — Federal law enforcement officials said Friday that the new emails uncovered in the closed investigation into Hillary Clinton’s use of a private email server were discovered after the F.B.I. 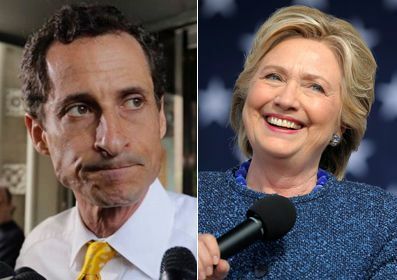 seized electronic devices belonging to Huma Abedin, a top aide to Mrs. Clinton, and her husband, Anthony D. Weiner. The Republican National Committee cheered the new attention on Mrs. Clinton’s emails as a potential turning point in the race. In September, Mr. Comey announced that the F.B.I. had closed the investigation after determining that no one should face criminal charges. But Mr. Comey did criticize Mrs. Clinton and her aides for what he termed the “extremely careless” handling of sensitive information. OCTOBER SURPRISE: FBI reopens Clinton email investigation after new messages found! Other GOP lawmakers also weighed in. Clinton did not respond to questions from reporters about the development as she landed in Cedar Rapids, Iowa. House Speaker Paul Ryan called the FBI decision "long overdue." This isn’t a guess. It is spelled out, in black and white, in the latest bombshell revelation from WikiLeaks. It comes in the form of a memo written in 2011 by longtime Clinton errand boy Doug Band, who for years worked simultaneously at the Clinton Foundation and at the head of his lucrative consulting business, Teneo. It is astonishingly detailed proof that the Clintons do not draw any lines between their “charitable” work, their political activity, their government jobs or (and most important) their personal enrichment. Every other American is expected to keep these pursuits separate, as required by tax law, anticorruption law and campaign-finance law. For the Clintons, it is all one and the same—the rules be damned. Amazing! 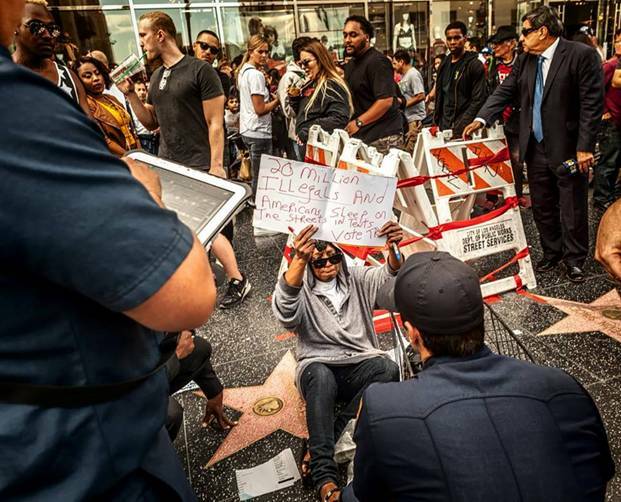 A Homeless Trump Supporter Guards Trump's Hollywood Star From Protestors! The Trump supporter is holding a sign that reads, “20 Million Illegals and Americans Sleep on the Streets in Tents. 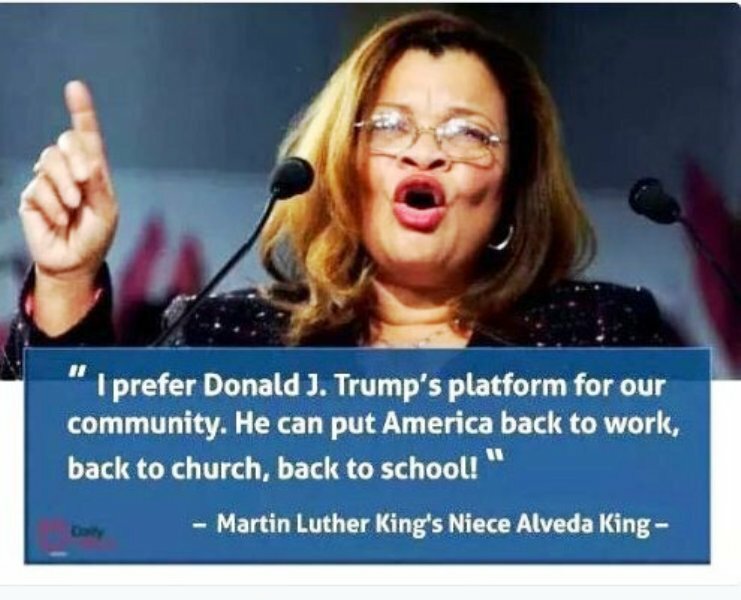 Vote Trump." According to a damning new report from Fox News, a defense contractor seeking approval from Hillary Clinton’s State Department for billions in foreign arms sales hired a trio of lobbyists who had raised funds for her 2008 presidential campaign (and would later for her 2016 campaign). Among them was Heather Podesta, then-sister in law to Clinton campaign Chairman John Podesta, who was a Senior Adviser to the State Department at the time. As lobbying records indicate, these Clinton, Inc. lobbyists, who had little experience with foreign arms deals previously, raked in hundreds of thousands in fees for “engag[ing] the Executive Branch on the economic benefits of foreign military sales,” were quickly able to secure approval for $26 billion in contracts for foreign sales all before Clinton left office, and their representation was no longer needed. EXCLUSIVE: Amid the tumult of the 2016 presidential campaign, John Podesta is best known as Hillary Clinton’s campaign chairman and the individual from whose private account WikiLeaks is presently publishing some 50,000 hacked emails. Released in daily batches, these documents have laid bare the inner workings and tensions of the Clinton campaign in an unprecedented way, while also offering insights into the operations of the Clinton Foundation and the State Department in the years when Clinton, now the Democratic presidential nominee, served as secretary of state. At that time, when Clinton was traveling to a record number of foreign countries, Podesta, a former White House chief of staff under President Clinton, held dual titles at the State Department: as a senior advisor – entitled to an annual salary of $130,000 never paid him, the department maintains – and as a member of a prestigious foreign policy advisory board Secretary Clinton created. Records obtained from the U.S. Office of Personnel Management show Podesta’s tenure at State extended from Sept. 25, 2011 to Jan. 4, 2014. For several months in 2012, Clinton’s final year as secretary of state, Raytheon, the leading defense contractor, hired Podesta’s sister-in-law, Heather Podesta, as a lobbyist, federal records show. 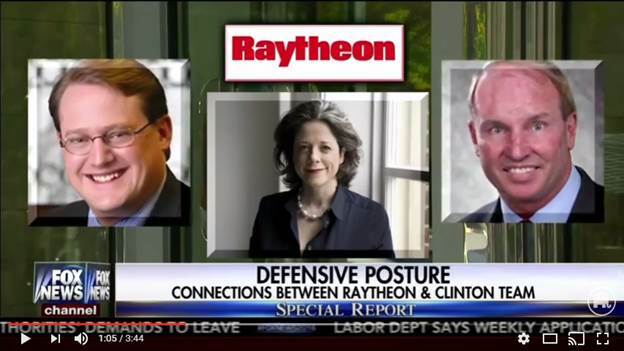 Raytheon was looking to enlarge its share of foreign military sales – transfers of advanced weapons systems to other countries that are reviewed and approved by the Department of State, then implemented by the Department of Defense – and was beefing up its lobbying operation to accomplish that goal before Secretary Clinton left office. On the LD-2 lobbying disclosure form completed by her company, Heather Podesta + Partners, LLC, in July 2012, the veteran lawyer and Democratic fundraiser listed in the space provided for a description of her lobbying activities, “Engaged the Executive Branch on the economic benefits of foreign military sales.” In the space requesting the specific locales of her lobbying, Ms. Podesta listed the White House and the State Department. At the same time, Raytheon retained two other lobbyists, John Merrigan and Matt Bernstein, both associated with the powerhouse D.C. law firm DLA Piper. All three of these lobbyists, including Ms. Podesta, were major donors or bundlers to Hillary Clinton’s 2008 and 2016 campaigns. 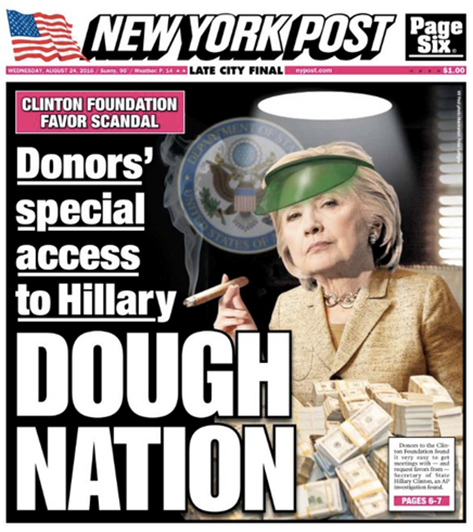 Federal records show they have raised hundreds of thousands of dollars for Clinton’s campaigns and earned hundreds of thousands of dollars lobbying her State Department. In the final three quarters of 2012, DLA Piper earned some $360,000 in lobbying fees from Raytheon, courting the State Department and other agencies, while Ms. Podesta, within that same time frame, received $100,000 from Raytheon for the same purpose. The gambit appears to have worked: Records maintained by the Defense Security Cooperation Agency, the arm of the Defense Department that coordinates the transfers of weapons systems once they have received State’s approval, show Raytheon as a prime contractor in at least seventeen foreign military sales in 2012, worth an estimated total of $26 billion. Of those contracts, three with the Gulf nation of Qatar – for missile defense, Apache attack helicopters and other materiel – accounted for $19 billion. An email from a Clinton Foundation official released earlier this month, in the sixth of Wikileaks’ postings of John Podesta’s emails, revealed that in 2011, the Qatari government had pledged $1 million to the foundation to help former President Clinton celebrate his birthday. In return, the email said, the Qataris sought a “five-minute” audience with Mr. Clinton. The individual at the State Department who was statutorily entrusted to approve foreign military sales was Andrew Shapiro, the assistant secretary of state for political and military affairs. Prior to his nomination to that job, Shapiro had served as Clinton’s national security adviser in her Senate office. Today, Shapiro is a partner in a Washington consulting firm whose other co-founders include Philippe Reines, Clinton’s longtime press aide. After Clinton stepped down as secretary of state in February 2013, Raytheon discontinued the services of Heather Podesta + Partners, and ceased its use of DLA Piper at State. While experts do not believe any laws were broken, the affair illustrates how Washington worked in the first Obama term, and particularly at the Clinton State Department. The Raytheon operation bears some similarity to a pop-up store that materializes to serve a seasonal need, such as Halloween candy or July Fourth fireworks, then vanishes once that need has been met. Donald Trump called for a “new deal for black America” in a Wednesday afternoon address, as he works to bridge the gap he faces with the crucial voting bloc less than two weeks from Election Day. Speaking in Charlotte, N.C., the GOP nominee criticized years of Democratic rule for leaving black America behind, and outlined his plan to help. My “deal is grounded in three promises: safe communities, great education, and high-paying jobs,” Trump said. Trump called on voters to repudiate Hillary Clinton and the Democrats in favor of change. “American politics is caught in a time loop, we keep electing the same people over and over and over,” he said. “I have a message for all the doubters in Washington: America’s future belongs to the dreamers, not the cynics and not the critics," he said. Trump called for incentives to move companies into blighted neighborhoods to bolster employment, help African-Americans get better access to credit and push cities to declare “blighted communities” disaster areas to help rebuild infrastructure. He also said he'd support increasing the number of police officers in such areas, connecting a lack of officers to a rise in murder rate in major cities. But while Trump’s call focused on removing “gang-members and criminal cartels,” he blamed Clinton for promoting a "war on police.” He did not mention the accusations of police brutality by minorities who feel that they are disproportionately targeted. It’s not the first time Trump has made a direct appeal to black voters -- overtures first appeared in scripted speeches in the late summer. 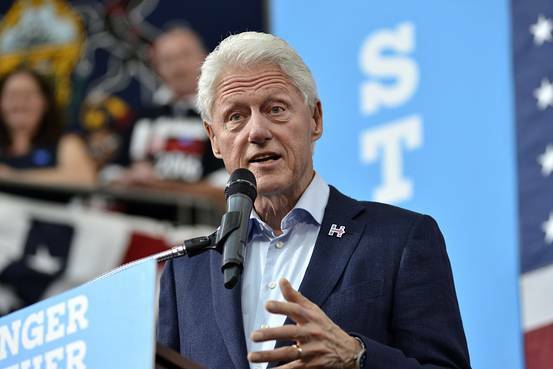 Money for special access: “Bill Clinton, Inc.” is in full effect. In February 2014, Senior Managing Director Of The Teneo Group, Orson Porter, Attempted To Set Up A Meeting Between BHP Billiton CEO Andrew Mackenzie And Then- White House Counselor John Podesta. Newly released emails from WikiLeaks show that while John Podesta served as White House Counselor, a senior Teneo executive was negotiating tens of millions for Bill Clinton and padding his own bottom line, while seeking to curry Clinton favor by getting a meeting for the CEO of one of its anchor clients, saying he’d “really appreciate if you could see Andrew [Mackenzie, the CEO of BHP Billiton].” Just as a simple favor. In A 2011 “Bill Clinton, Inc.” memo To Clinton Foundation Auditors, Doug Band Noted That BHP Billiton Had Donated $20,000 TO The Clinton Global Initiative (CGI) In 2011, And Had Been A Client Of Teneo’s Since Early 2011. On June 20, 2012, Bill Clinton Was Paid $175,000 For A Speech To BHP Billiton. Last year’s 12% increase in homicides reported to the FBI is the largest one-year homicide increase in nearly half a century. The primary victims have been black. An additional 900 black males were killed last year compared with the previous year, resulting in a homicide victimization rate that is now nine times greater for black males than for white males, according to a Guardian study. The brutality of these killings can be shocking. Over the weekend of Sept. 16, a 15-year-old boy in Chicago was burned alive in a dumpster. More police are being killed this year too. Gun murders of police officers are up 47% nationally through Oct. 21, compared with the same period the previous year. In Chicago gun assaults on officers are up 100%. In New York City attacks on officers are up 23%. In the last two weeks, four California officers have been deliberately murdered. Gangbanger John Felix prepared for his lethal attack on two Palm Springs officers on Oct. 8 by setting a trap and ambushing them as they stood outside his door. Two days earlier, parolee Trenton Trevon Lovell shot Los Angeles Sheriff’s Sgt. Steve Owen in the face as he investigated a burglary call. Lovell then stood over Sgt. Owen and fired four additional rounds into his body. A planned assassination of two officers on coffee break in Vallejo, Calif., on Oct. 17 failed only when the assault rifle used in the attack jammed. In Indianapolis on Oct. 13, police headquarters were sprayed with bullets by a car that then fled, echoing a similar attack on Oct. 4 against the same police station. Officers are second-guessing their own justified use of force for fear of being labeled racist and losing their jobs, if not their freedom. On Oct. 5 a female officer in Chicago was beaten unconscious by a suspect in a car crash, who repeatedly bashed her face into the concrete and tore out chunks of her hair. She refrained from using her gun, she said, because she didn’t want to become the next viral video in the Black Lives Matter narrative. The Chicago Police Department now wants to institutionalize such dangerous second-guessing. Its proposed guidelines for using force would require cops to consider the “impact that even a reasonable use of force may have on those who observe” it. A Los Angeles police officer recently described to me his current thought process in deciding whether to intervene in suspicious or criminal behavior. A man high on meth was violently accosting pedestrians around a Santa Monica bike path. The cops were “very hesitant to arrest,” the officer said, because “we knew we would be on YouTube before we could get back to the station.” That reluctance to make contact intensifies when the suspect is black, he added. The Black Lives Matter narrative about an epidemic of racially biased police shootings is false: Four studies published this year showed that if there is a bias in police shootings, it works in favor of blacks and against whites. Officers’ use of lethal force following an arrest for a violent felony is more than twice the rate for white as for black arrestees, according to one study. Another study showed that officers were three times less likely to shoot unarmed black suspects than unarmed whites. We are at a crucial juncture on law and order. Police officers unquestionably need more hands-on tactical training that will help them make split-second shoot-don’t shoot decisions. Some officers develop obnoxious attitudes toward civilians that must be eradicated. No government agency is more dedicated to the proposition that black lives matter than the police. If the next administration continues to disregard that truth in favor of a false narrative about systemic law-enforcement racism, the next four years will see more urban violence and race riots, and more dead cops. Ms. Mac Donald, a fellow at the Manhattan Institute, is the author of “The War on Cops” (Encounter Books, 2016).